Somewhere there’s an alternate universe in which there’s only one media outlet that plays nothing but new songs, every one of which is written by Ryan Adams. This universe may not be very far removed from our own. This is, after all, the person who once delivered three albums in a single year, one of them a double, and all of them totally fabulous. This is the person who was asked by Cameron Crowe to write a track for his new film, Elizabethtown, and returned with a whole album of songs, most of which are better than the material that was actually used in the film. This is the person who retired from music in 2009, only to release a new album in 2011. Oh, and he also released a metal album in between times. Now, thankfully, Ryan Adams is officially back. He’s just released a set of recordings from his ‘comeback’ tour last year. It comprises highlights from 15 different shows, each sold separately, plus 74 digital-only previously unreleased bonus tracks, which is just a tiny part of his unreleased work. The Glasgow show is, probably, representative of these live releases. 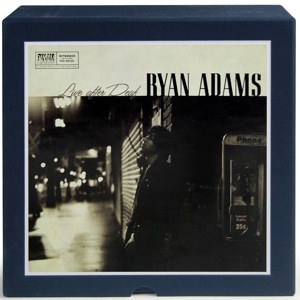 Like Neil Young, Ryan Adams at at his best when he’s loose, spontaneous, busy. Here, it’s just himself, a guitar, and, on one song, a gob iron too. This set favours the earlier years of his work. There’s ’16 Days’ from his Whiskeytown era, a sublime cut of ‘My Winding Wheel’ from Heartbreaker, and a really clean version of ‘Sweet Illusions’ from Cold Roses. There’s also a particularly fine rendition of ‘English Girls Approximately’, the lyrics of which which are only partly appropriate given the venue. Typically, on this set at least, there is nothing from Ashes and Fire, his 2011 album. On the Glasgow album, there’s at least one sign of his genius. An audience member, seemingly randomly, calls out ‘Goodnight Bob’. Adams then proceeds to improvise a song with that title. It’s genuinely funny. Sure, you could only listen to it once, but it’s got some nice chord changes, and it gives a glimpse of just how much talent lies within. What more is there to say about him apart from the fact that there is at least one alternate universe in which I would like to live. Posted in Ryan Adams and tagged as Music, Review.